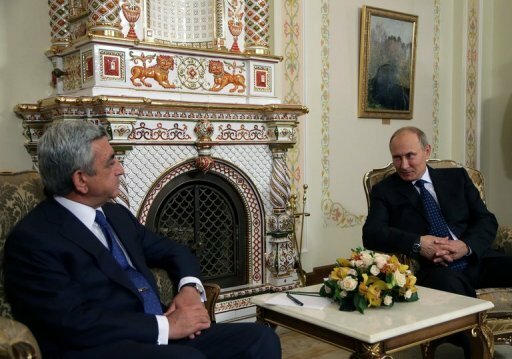 Russian President Vladimir Putin (R) and Armenian president Serzh Sarkisian (L) meet outside Moscow, on September 3, 2013. "We respect any choice of countries but they cannot enter both organisations at the same time because of different tariff requirements," he said. Armenia had been poised to initial an association and free trade agreement with EU at a November summit in Vilnius with six post-Soviet states grouped in the Brussels-oriented Eastern Partnership programme. Vilnius University analyst Vytis Jurkonis said Tuesday Armenia’s move was "part of the bigger game" by Russia which has recently warned Ukraine and Moldova that deals with EU may harm their economic ties with Moscow. "Russia is increasing pressure on Eastern Partnership countries so they do not sign association treaties" with Brussels, Jurkonis told AFP. "Any economic threat or political pressure directed against Eastern partners because of their European aspirations and engagement with the EU is unacceptable," they said.